Traditional chemical treatments for fleas are not working because fleas can build up an immunity to chemicals, and the early Spring heat is adding to the problem of flea infestations. Chemical pesticides can be a danger to pets and humans. Non-toxic flea treatments are far more effective. The early Spring and mild winter have produced enough heat to keep fleas alive and well says a new report from Planet Amazing. "Most fleas did not hybernate this year, especially in the Southern United States, which means they are starting their reproductive cycle early and thus there are a lot of early flea infestations which are not typical," says Justin Douglas, expert researcher for Planet Amazing. "In addition, the phenomenon of 'resistance' is another issue, since fleas have been building up a resistance to the chemical-based treatments over the last 30 years, making some types of fleas completely resistant to store-bought flea pesticides," Mr. Douglas says. "When fleas become immune to the chemicals then the fleas will continue to live in the home even after flea treatment, and that is not the only problem with chemicals," he says, as chemical pesticides can be a danger to pets and humans. According to CNN, pesticides have been linked to ADHD in children as well as other problems in humans: "Organophosphates are designed to have toxic effects on the nervous system. That's how they kill pests. The pesticides act on a set of brain chemicals closely related to those involved in ADHD, so it seems plausible that exposure to organophosphates could be associated with ADHD-like symptoms." Mr. Douglas says this relationship between pesticides and ADHD in children is one of many reasons to stop using chemical-based pest control and start using Planet Amazing environmentally safe non-toxic pest control like Flea Shredder flea cure. "The non-toxic microcrystal flea treatments from Planet Amazing solve this because no chemicals are involved and fleas cannot resist the microcrystals effect," he says. "For flea cures, our Flea Shredder flea control is using microcrystals which are going to kill fleas quickly with only a small bit of powder that is completely safe for plants, pets and humans. Our products are approved by the Environmental Protection Agency, and the EPA has given Flea Shredder a safe rating. With Flea Shredder there are no chemicals being introduced to your home." 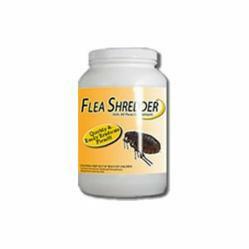 For more information on Flea Shredder Flea Killer, check out the website. Planet Amazing is an EPA registered manufacturer and packager of family friendly and environmentally safe pesticides and other products. Planet Amazing sets high standards for their operating companies in the area of environmental responsibility — striving for performance that does not merely comply with regulations but reduces the environmental impact. They commit to take care of our planet and preserve its beauty, resources and strength for future generations. Planet Amazing embraces research and science - bringing innovative ideas, products and services to advance the lives and well-being of people. Employees of the Planet Amazing family of companies work with its partners in order to touch the lives of people every day, throughout the world.